This is still one of the best available collections of Australian Aboriginal folklore. It was written for a popular audience, but the stories are retold with integrity, and not filtered, as was the case with similar books from this period. That said, the style of this book reflects Victorian sentimentality and, an occasional tinge of racism that may not sit well with some modern readers. 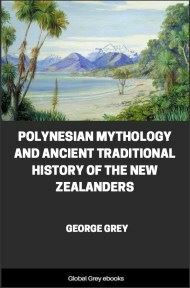 Tales include: Dinewan The Emu, And Goomblegubbon The Bustard; The Galah, And Oolah The Lizard; Bahloo The Moon And The Daens; The Origin Of The Narran Lake; Gooloo The Magpie, And The Wahroogah; The Weeoonibeens And The Piggiebillah; Bootoolgah The Crane And Goonur The Kangaroo Rat, The Fire Makers; Weedah The Mocking Bird; The Gwineeboos The Redbreasts; and many more. AUSTRALIA makes an appeal to the fancy which is all its own. When Cortes entered Mexico, in the most romantic moment of history, it was as if men had found their way to a new planet, so strange, so long hidden from Europe was all that they beheld. Still they found kings, nobles, peasants, palaces, temples, a great organised society, fauna and flora not so very different from what they had left behind in Spain. In Australia all was novel, and, while seeming fresh, was inestimably old. The vegetation differs from ours; the monotonous grey gum-trees did not resemble our varied forests, but were antique, melancholy, featureless, like their own continent of rare hills, infrequent streams and interminable deserts, concealing nothing within their wastes, yet promising a secret. The birds and beasts--kangaroo, platypus, emu--are ancient types, rough grotesques of Nature, sketching as a child draws. The natives were a race without a history, far more antique than Egypt, nearer the beginnings than any other people. Their weapons are the most primitive: those of the extinct Tasmanians were actually palæolithic. The soil holds no pottery, the cave walls no pictures drawn by men more advanced; the sea hides no ruined palaces; no cities are buried in the plains; there is not a trace of inscriptions or of agriculture. The burying places contain relics of men perhaps even lower than the existing tribes; nothing attests the presence in any age of men more cultivated. Perhaps myriads of years have gone by since the Delta, or the lands beside Euphrates and Tigris were as blank of human modification as was the whole Australian continent. The manners and rites of the natives were far the most archaic of all with which we are acquainted. Temples they had none: no images of gods, no altars of sacrifice; scarce any memorials of the dead. Their worship at best was offered in hymns to some vague, half-forgotten deity or First Maker of things, a god decrepit from age or all but careless of his children. Spirits were known and feared, but scarcely defined or described. Sympathetic magic, and perhaps a little hypnotism, were all their science. Kings and nations they knew not; they were wanderers, houseless and homeless. Custom was king; yet custom was tenacious, irresistible, and as complex in minute details as the etiquette of Spanish kings, or the ritual of the Flamens of Rome. The archaic intricacies and taboos of the customs and regulations of marriage might puzzle a mathematician, and may, when unravelled, explain the less complicated prohibitions of a totemism less antique. The people themselves in their struggle for existence had developed great ingenuities. They had the boomerang and the weet-weet, but not the bow; the throwing stick, but not, of course, the sword; the message stick, but no hieroglyphs; and their art was almost purely decorative, in geometrical patterns, not representative. They deemed themselves akin to all nature, and called cousins with rain and smoke, with clouds and sky, as well as with beasts and trees. They were adroit hunters, skilled trackers, born sportsmen; they now ride well, and, for savages, play cricket fairly. But, being invaded by the practical emigrant or the careless convict, the natives were not studied when in their prime, and science began to examine them almost too late. We have the works of Sir George Grey, the too brief pamphlet of Mr. Gideon Lang, the more learned labours of Messrs. Fison and Howitt, and the collections of Mr. Brough Smyth. The mysteries (Bora) of the natives, the initiatory rites, a little of the magic, a great deal of the social customs are known to us, and we have fragments of the myths. 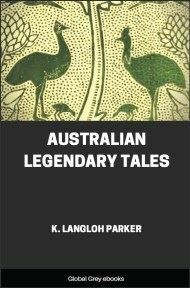 But, till Mrs. Langloh Parker wrote this book, we had but few of the stories which Australian natives tell by the camp-fire or in the gum-tree shade. These, for the most part, are Kinder Märchen, though they include many ætiological myths, explanatory of the markings and habits of animals, the origin of constellations, and so forth. They are a savage edition of the Metamorphoses, and few unbiased students now doubt that the Metamorphoses are a very late and very artificial version of traditional tales as savage in origin as those of the Noongahburrah. I have read Mrs. Parker's collection with very great interest, with "human pleasure," merely for the story's sake. Children will find here the Jungle Book, never before printed, of black little boys and girls. The sympathy with, and knowledge of beast-life and bird-life are worthy of Mr. Kipling, and the grotesque names are just what children like. Dinewan and Goomblegubbon should take their place with Rikki Tikki and Mr. Kipling's other delightful creatures. But there is here no Mowgli, set apart in the jungle as a man. Man, bird, and beast are all blended in the Australian fancy as in that of Bushmen and Red Indians. All are of one kindred, all shade into each other; all obey the Bush Law as they obey the Jungle Law in Mr. Kipling's fascinating stories. This confusion, of course, is not peculiar to Australian Märchen; it is the prevalent feature of our own popular tales. But the Australians "do it more natural:" the stories are not the heritage of a traditional and dead, but the flowers of a living and actual condition of the mind. The stories have not the ingenious dramatic turns of our own Märchen. Where there are no distinctions of wealth and rank, there can be no Cinderella and no Puss in Boots. Many stories are rude ætiological myths; they explain the habits and characteristics of the birds and beasts, and account in a familiar way for the origin of death ("Bahloo, the Moon, and the Daens"). The origin of fire is also accounted for in what may almost be called a scientific way. Once discovered, it is, of course, stolen from the original proprietors. A savage cannot believe that the first owners of fire would give the secret away. The inventors of the myth of Prometheus were of the same mind.